Actors posing with their stunt doubles. We tend to think that our favorite actresses and actors are capable of doing anything. But there are certain things, mostly dangerous things, that can only be done by qualified and trained people who studied and practiced to become stunt doubles. They often look alike our favorite stars and many many times, they work with them in several movies and sometimes become friends with the stars! 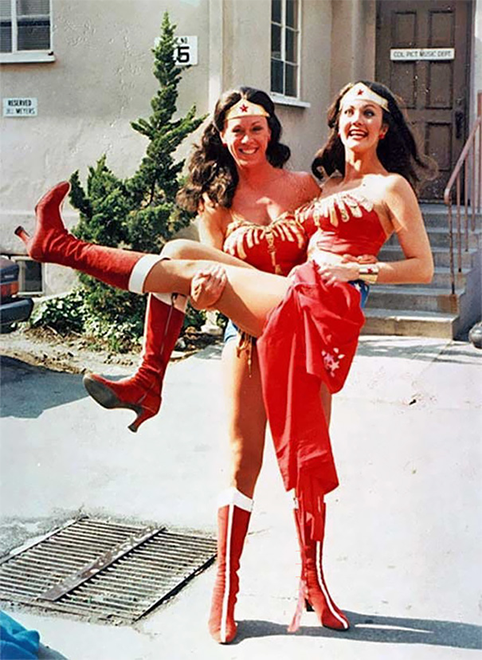 I have collected 50 awesome photos of actresses and actors posing with their stunt doubles. From Emma Watson's to the game of thrones stars' doubles, here are the 50 photos for you to enjoy! This is a very funny photo of Lynda Carter and her Wonder Woman acting double Jeannie Epper. They look very happy together and they actually became close friends during the shooting. Omg look at how many Hermiones are there in this photo! It seems that Emma Watson needed not one but THREE stunt doubles on the shooting of Harry Potter and the Order of the Phoenix.